본 상품은 해당국가 Korean의 수입금지 품목으로 배송이 불가합니다..
국제배송: 본 상품은 해당국가 Korean의 수입금지 품목으로 배송이 불가합니다.. 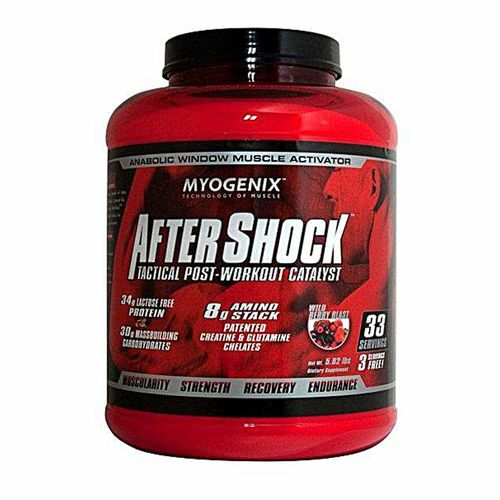 Encourage anabolism to prime your body for muscle-building following your workout with AfterShock from Myogenix. This product utilizes 34 grams of whey protein along with carbohydrates, amino acids, antioxidants and a joint support formula. AfterShock from Myogenix works to fuel your body for the period post-workout when you can acquire significant muscle growth. In addition, the nutrients in this formula may aid with replenishing glycogen and the recovery process. 주의: This product contains ingredients derived from milk & soy. Manufactured in a facility that processes milk, soy, egg, wheat. Consult your healthcare professional prior to use if you have or suspect a medical condition, are taking prescription drugs, are pregnant or lactating or have an allergy to shellfish. 참고: Store in a cool, dry place, away from sunlight. 제품사용법: Mix 1 serving of AfterShock (80 g) with 12 to 16 oz. of water and consume immediately after exercising. For total body transformation, use HyperShock pre-workout and MyoLean Evolution.